marta writes: wrapping up our home is tugging at my heart. wrapping up our home is tugging at my heart. the sadness has hit. church was tough today. i don't like goodbyes. three years here has made us some good friends and i don't want to imagine my day-to-day life without them. my friends and i chat about our kids, admire each other's mothering skills, inquire about illnesses, hold babies, discuss playdates via text message, support each other's endeavors, sit on sofas and listen, swap recipes, complain about the weather, and constantly exchange baked goods back and forth. one week, it seemed like a session of cupcake wars, as we were continuously bombarded with frosted items on paper plates. i love that friends can speak volumes with sugar. 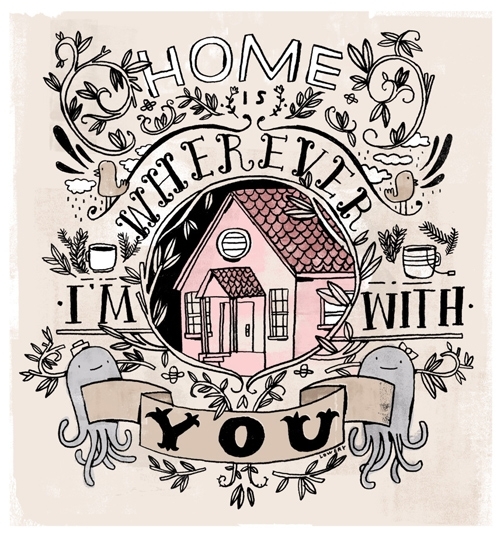 am trying to remember that home is where the heart is. am trying to be brave and look at all the blessings and opportunities ahead. this will be our sixth move in less than ten years as a married couple. you'd think i'd be a pro at this by now. but, no, change is still a challenge for me. i hope i can somehow convey my thanks, these friends have meant so much to me. they know me and have been there at the darkest part of my life thus far–my miscarriage last year–they listened and hugged and fed my family. they held me up and let me be sad. they love benji and give him loads of attention. tonight we were spoiled with a fresh strawberry pie and real whipped cream. however i also know there are good people in every neighborhood, i know i can make friends elsewhere, i know there are more lessons to learn and more play pals for benji. in other news, the moving sale went great. thanks to my friends who helped out and supported me in coming! i had no idea the effect some signs and balloons could have! (photos coming soon or someday. blogging is still going to be my refuge; however i have no idea how often or when i can come and say hi. it will be a day by day experiment.) hooray for strangers enjoying our loot. i was pleased to see my flipflops, some baby clothes, dishes, scrapbook paper, dan's corduroy jacket(s), my red kitchen rug, some jewelry, a box kite, and more go to excited owners. i think i could really get into this whole yard sale thing. next time i am totally packaging up cookies to sell, the freebie treats were a hit. hilary made chocolate chip orange drop cookies which we all swooned over. it was like a party, a party involving haggling. even my broken clock (labeled, broken) sold for $1.00! yay. a cheap thrill! however no one wanted picture frames or dan's old suspenders. a few cute bloggers showed up too. (thank you so much, it is awesome to put faces to names!) it was fun to have one last hurrah. we even celebrated with a date night afterwards. now i know not to host a moving sale right before you move. because moving sales are way more fun than packing and thus the best excuse to procrastinate. this week is go time. i am all geared up. right now i am uploading photos–including new york city shots–to walmart.com so that i can finalize filling my empty 2010 and 2011 albums the second i unpack them. the fact that they are not filled with happy memories in photo form is already stressing me out. i guess when you are planning to leave something, you want to capture everything up before you leave it. in related news, benji and dan had a day at a real working farm yesterday. benji got to bottle feed a three day old calf. this is why idaho is awesome. back to bubble wrapping. xo. It seems like you just moved to ID how can it have been three years? The moving part sounds stressful. Good luck. I am sure you will be a hit where ever you end up and your new friends will be happy to meet you. Love that illustration. I just blogged about this exact thing. Although we're just moving across town, it's still hard for me to say goodbye to our little nest. Hugs and prayers for a great move! Packing up is so hard on the heart. Prayer for you and your family. It feels so good to open up boxes and put your well loved things into a fresh spot. So much to see and explore. Marta, I believe goodness and beauty will follow you all the days of your life. Good music and the "know-them-by-heart-so-i-don't-have-to-really-pay-attention-movies" makes packing more enjoyable! I will be praying for you during this time...for peace and joy in the midst of goodbyes. I'm glad the moving sale went well!! Moving is tough. When you're feeling sad, pull yourself away from all the packing and watch this darling video. I promise it will make you smile. Ugh. Can I just say I have been a complete and total mess over this whole thing? One moment I am so stinking excited for you, the next I'm sobbing feeling sorry for myself that Marta will no longer be just down the road and around the corner. You guys are going to have such a wonderful time being so close to family. You and Dan are magnetic and will make loads of friends, just as you did here and every other place you have been. Good-byes are the worst, especially to friends who have gotten you through the lowest of lows. But, the hello's to friendly new faces are oh so exciting! Keep packing! You can do it! And find a good music-to-pack-by soundtrack that will always take you back to this bittersweet time. it's hard to be the new girl. it's hard to always be introducing yourself. to have to repeat the same stories over again about where you came from....how long ago you moved....why....how many kids....what street are you on? after a bit it gets really old. and you LONG for someone to know you. to have a comfortable friend there that can just BE and KNOWS you. so....i understand why it's hard. I've been married for five years and have moved 6 times including 2 round trips from Hawaii to the mainland and back, and right now we're staying with family waiting for the right job opportunity to come our way, so we havent put down any roots for about a year now. Last year was kinda crazy. It's been a lonely time as I've been afraid to get close to anyone since I'm not sure how long we'll be in any one place as we bounce around looking for work. I feel like I'm always the new girl and it's not fun (especially at church), but it makes me more determined to be welcoming to new people (when I am finally, one day, NOT the new person). Best of luck with your transition. I certainly know how difficult that can be. I'm helping my parents move in Utah (eek what was i thinking?!) so i totally know how you feel... about the moving part. We aren't moving for another year and a half, but just thinking about leaving my church friends and the life i've grown to love makes me super sad. I feel so similar to this right now. I have made some great friends at church, and I have truly never felt as welcome in my last two wards as I have in this one, and now we're leaving! It makes me so sad, and I've been fighting back tears regularly. Finally lost control as I told my daughter's nursery teacher that next week will be our last. :'( I felt so silly...but it is very hard to leave a place that has been so good. The only thing that keeps me going is the sure knowledge that I have, that the move we are making is the Lord's will. There is a reason we have been led to Colorado, and I'm kind of excited to find out what that is. Don't worry, it will get sooo much easier. I'm the same way with the constant moves as a married couple and we too will land somewhere much more permanent this time next year. I must admit that my first move once we had our first child was my most sentimental. All the memories of being pregnant and all the baby memories really got to me! It becomes much more real when relocating involves pediatricians and playgroups! Oh wow, good luck with your move! I'm in the middle of one too, so I totally feel your pain - this will be our ninth move in three years (due to university and a house fire)!